The Lockheed F-117's Stealth characteristics were a design that followed the grim Vietnam War air losses. During the war, US aircraft losses were tremendous and the culprit was a sophisticated network of Surface to Air Missiles controlled by Radar. So, Lockheed and several other companies went into designing a new type of aircraft to counter the threat of Radar guided SAMs. The result was 'Stealth'. The outcome of the 1973 Yom Kippur War was another major factor in developing stealth. Israel lost an estimated 109 aircraft in 18 days to Surface to Air Missiles, mainly the Russian SA-6 SAM on a mobile launcher still feared today. In Recent years Russia has developed an increasing network of very advanced SAMs with equally advanced Radar systems for fire control and Early Warning. It is the Early Warning Radar that aircraft designers are concerned about. In 1974 DARPA (Defense Advanced Research Projects Agency) requested a design for a next generation aircraft from McDonnell Douglas, Northrop, General Dynamics, Fairchild and Grumman. After the initial submissions for the requirement of an aircraft 'undetectable' by radar, Grumman and Fairchild pulled out of the competition. Instead of a radar-invisible plane, General Dynamics proposed a more advanced electronic countermeasures suite for all aircraft, to counter the threat of more advanced radar systems. Eventually only Northrop and McDonnell Douglas went ahead with the program and were both awarded $100,000 to continue the design program for a further few months until the end of 1974. In January 1975 Ben Rich became president of Lockheed 'Skunkworks' at Burbank, Los Angeles. Lockheed had not been part of the original study for an undetected low observable aircraft but expressed keen interest now. Ben Rich was contacted by the CIA to discuss the program with DARPA, and Lockheed's experience with earlier low observable platforms such as the A-12 and D-21 drone. After the discussions, which lasted months, Lockheed was finally allowed to enter the competition. What was unusual is that this was not under a Government contract, like the other companies had! Skunkworks then went on to design this new generation of low observable aircraft, integrating several design concepts of minimized detection of Radar Cross Signature (RCS). They finally came up with a completely outrageous design, which they appropriately named the 'Hopeless Diamond'. The outcome of the design was named 'Echo-1'. 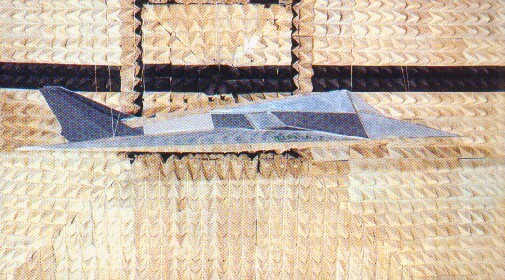 Two wooden 1/3 scale models were built of the 'Echo-1' Hopeless Diamond. One model was to be used for aerodynamic testing and the other model as an RCS test platform. The RCS measurements were performed in Lockheed's anechoic chamber. Later in 1975, the RCS model was moved to Lockheed's Helendale RCS Range near Edwards AFB for proper outdoor RCS testing. Lockheed's design had similarities to Northrop's Design, looking very similar, but Northrop's design was made by a computer, using a program called GENSCAT. McDonnell Douglas on the other hand had no aircraft to show, however they were the first company to figure out the goals and thresholds of the RCS needed. With Northrop and Lockheed now battling it out for the contract, DARPA set new standards, calling for a full scale model for further RCS testing and in a second phase for a flight test prototype. The first phase was done at Lockheed's Helendale RCS Facility and McDD's El Mirage Facility, both very close to Edwards AFB and Plant 42. Finally in April 1976 Lockheed was declared the winner of Phase 1. However, DARPA told Northrop to continue development of their concept as well. Phase 2 called for a fully functional test platform for further tests and evaluation. Lockheeds prototype was code-named 'Have Blue'. Northrops development, code-named 'Tacit Blue', was eventually discontinued, but the knowledge gained from the project proved to be very valuable a few years later in Northrop's design of the B-2 Stealth Bomber. The 'Have Blue' program was built in the legendary 'Building 82' where the A-12 and U-2 were built earlier. Early on November 16th 1976 'Have Blue' was loaded into a C-5A Galaxy and flown out of Burbank to the highly secret Test Facility near Groom Lake, called Area 51. It was then re-assembled and readied for further tests and development to be carried out in strict secrecy. HB1001 the HAVE BLUE Prototype...and its Demise! On December 1st 1977, Skunkworks test pilot Bill Park climbed into the Have Blue prototype with the designation 'HB1001' and took it on its maiden flight out of Area 51. A second test pilot was selected from the US Air Force: Ken Dyson, a former F-15 test pilot and director of the joint test force for the F15 program. The first five flights of HB1001 were all flown by Lockheed's Bill Park with Dyson flying in a T-38 'Chase' Plane alongside of HB1001. On January 17th 1978 was Ken Dyson's first flight in HB1001. By May 4th 1978 Bill Park had completed 24 tests in the HB1001 and Ken Dyson 12 test flights. It was then that things started to go wrong in the flight test program. Bill Park was on his way back from a flight test. While landing at Area 51, he damaged the main undercarriage and then took off again and retracted the legs. Bill went around for another landing attempt, but realized that the damaged leg would only extend half way. He tried to pound the 'good' leg on the runway to try and shake free the damaged leg, but it remained stuck. Time was running out for Bill Park. Running low on fuel, he decided to climb back up to 10,000ft and eject. However on his climb up to 10,000ft HB1001 completely ran out of fuel and Bill Park was forced to eject before the aircraft stalled and fell to the desert floor. Unfortunately the force of the ejection knocked Bill unconscious. His parachute deployed automatically, but he was still unconscious when he hit the ground. As he was not able to make a safe landing he sustained severe back and leg injury which forced him to retire flying. The second prototype, HB1002, took 6 months to complete and be readied for its maiden flight in the early morning of July 20th 1978 with Ken Dyson at the controls. Ken took HB1002 on three test flights to make sure the aircraft would handle like HB1001. After the initial 3 flights the RCS measurements began. Ken flew the aircraft over a radar test facility, which may have been at Site 4 or at Area 51 itself. It was on one of these tests that HB1002 had its first malfunction. Ken was flying against a Radar facility to measure nose on (zero) Cross Section when he engaged the autopilot. The aircraft immediately began to malfunction. The nose went right while the wing rolled left. Ken decided to switch off the autopilot and the aircraft became 'flyable' again. Apparently the autopilot problem was never solved and Ken flew manually after this. Dyson took off and had the F-15 Chase plane look him over for visual checks of the HB1002 and everything seemed OK. He then flew out of Groom Airspace and went head to head against the F-15 for an RCS test of the F-15s radar to see if it lit up the HB1002. Dyson was just short of the designated turn point when he noticed the same system malfunction as he did before when he had to air-abort the take-off. Immediately he turned back towards Area 51 and terminated the test with the F-15. He was just telling Area 51 Test Control about the problem when he noticed the Engine Fire Warning light glowing red! Dyson immediately let off the power to the engines and after telling control of this new, more serious, problem he shut down one of the engines. However the Have Blue, being a rather unstable flying machine due to its shape, did not fly well on one engine and he could not use full power. Dyson had the aircraft pointed directly towards Area 51 and was between 20-25,000ft. Then suddenly the only remaining hydraulic system started to fluctuate in a downward direction. At this time, the aircraft pitched down very violently between 7-8 negative G's !! Not good at all for any pilot, experienced or not. It then immediately pitched up violently and Ken described the movements as 'just eye watering', something a normal aircraft could not do! HB1002 was now at around 225kts and still above 20,000ft tossing Ken up and down in the cockpit. As Ken describes it: 'The aircraft was near vertical in the down position and was near vertical in the upward position all in a matter of a few seconds.' It did movements that most pilots could not handle, especially the severe negative 7-8 G's! Ken then tried to reach the ejection handle between his legs but with the severe amount of G's being put on his body he found it extremely difficult to even move his hands. He eventually grabbed and pulled the handle, releasing the cockpit canopy and then rocketing out in his ejection seat. He watched his aircraft violently twist and turn as it fell rapidly towards the desert floor and exploded on impact. The crash of HB1002 did not impact the program much, because flight-testing under the Have Blue program was nearly over, with only 3 more flights to go. Lockheed was given $340 million to built five full-scale aircraft for further evaluation, under the new project name 'Senior Trend'. The first Senior Trend flew in 1979 at Lockheeds Skunk Works facility in Burbank. Bill Park, who had to retire due to his injuries in the Have Blue program, now trained future pilots to fly the Senior Trend aircraft. He recruited several top pilots, including some who had actually retired from flying and one pilot who was involved in a top secret program operating out of Area 51, known as the 'Red Hat' Squadron. Its mission was to evaluate Russian aircraft like the MiG-17, MiG-19 and MiG-21. The Red Hats were the only operational squadron to fly out of Area 51. On January 16th 1981, a C-5 landed at Area 51 carrying the first Senior Trend aircraft from Burbank. It was known as FSD-1 or Aircraft 780. Hal Farley, one of the recruits of Bill Park was the first test pilot to fly the Senior Trend, on June 18th 1981 from Area 51. On September 24th 1981, FSD-2 (Aircraft 781) was flown into Area 51 by one of the other pilots, Dave Ferguson. He flew the aircraft on its secret night take-off from Burbank to Area 51. 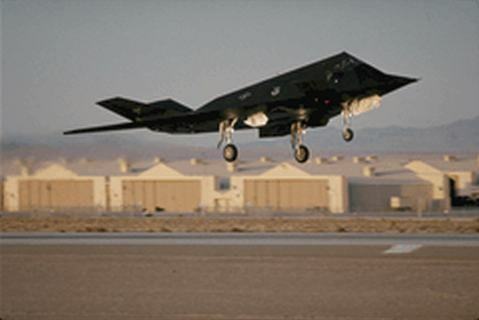 Flight tests then continued from Area 51 but after four sorties the aircraft were to be re-configured to include the systems and appearance of the F-117 as it is today. The Senior Trend aircraft were re-configured and the name was changed to the official Fighter designation, F-117A. The Senior Trend/F-117A flight testing at Area 51 was completed and the program was moved to another secret testing facility, the Tonopah Test Range (TTR), located 65 miles northwest of Area 51. Flight tests at TTR were done by the 4450th Tactical Group, code-named A-Unit, under the command of Robert 'Burner' Jackson. Officially, this unit flew a fleet of 20 A-7D Corsairs for a series of large Avionics Testing. While the Corsairs were actually used for testing and pilot proficiency training, it was mostly a cover story for the still top-secret F-117 program. And so, for years TTR was operating A-7D Corsairs, unbeknown that the hangers housed the worlds most top secret aircraft program...the F-117A. The A-7D's and a few two seat A-7K's were actually based at Nellis AFB. They were flown to TTR for the mock testing and for support roles by the 4451st Test Squadron, or P-Unit, nicknamed Ghostriders. In 1981, the 4450th Tactical Group formed the 4450th Test Squadron, or I-Unit, nicknamed Nightstalkers. Other units involved in the program were the 4452nd Test Squadron Goat Suckers, or Q-unit, and the 4453rd Test Squadron Grim Reapers, or Z-Unit. It was time to recruit more pilots to fly the chase aircraft and the F-117A aircraft. Recruitment began at the Nellis Area 2 complex, also known as Lake Mead Base, about 2 miles NW of Nellis AFB. The pilots were shown photos of what they would be flying and they were told that from then on they were to be working in a 'Black' environment. They could not talk about their work, not even to their wives. Complete secrecy was imperative! The first production aircraft (785) was flown in a transport aircraft from Burbank to Area 51, where it was re-assembled. From Area 51 it was to be flown to Tonopah Test Range, only a short hop away. The pilot, Bob Riedenauer, took off from the long runway at Area 51, but immediately after rotation things went very wrong. The aircraft did a complete snap role, yawing very violently, and rolled over to crash on its back. Bob survived the impact but 785 was completely destroyed. It was later determined that the fly-by-wire controls had been re-assembled incorrectly, inverting the pilot's control input and making the aircraft virtually impossible to fly. As tests continued at Tonopah Test Range, accidents started to happen with the production aircraft. It became clear that flying these aircraft in strict secrecy at night took its toll on the pilots. In 1986, at 1.13am in the morning, Aircraft 792 (call sign 'Ariel 31') departed the Tonopah Test Range for a test flight. Weather conditions were excellent with a clear sky. About 30 minutes later the pilot flew into a mountain and was killed. Investigations showed that the cause was pilot fatigue and disorientation. In October 1987 at 7.53pm, Aircraft 815 (call sign 'Burner 54') took off from TTR and again the aircraft flew into terrain. Investigations found pilot fatigue again as a possible factor. Six Days after that accident one of the A-7D's that took off from Tonopah Test Range, call sign 'Bandit 222', was on a test flight far away from its base...over Indianapolis! Tragically the A-7D crashed into the Ramada Hotel after it lost all power and the pilot ejected, killing several people in the hotel. 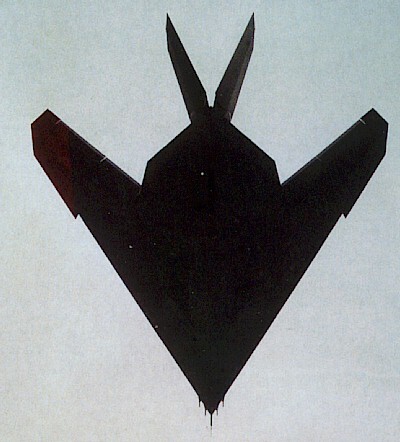 After so many years of being 'in the black', in 1988 the Pentagon revealed a very poor shot of the F-117 to the public. The F-117 was now becoming a 'white world' aircraft. In 1989 the aircraft were flown, trailed behind tankers, to Panama to take part in strikes against Noriega. This was when the F-117 actually became 'White'.